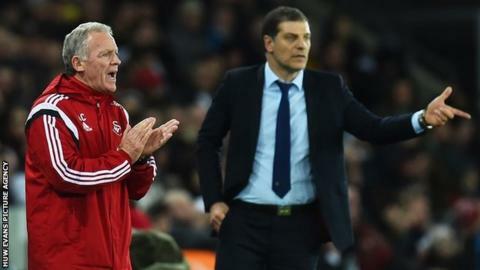 Swansea City caretaker manager Alan Curtis expects to stay in charge for the Boxing Day match against West Brom. Curtis, 61, has been at the helm since Garry Monk was sacked on 9 December, and chairman Huw Jenkins is still searching for a new manager. Swansea's 0-0 draw with West Ham means they will be in the Premier League relegation zone on Christmas Day. "We are preparing [as if we are in charge] - there is such a quick turnaround of games," said Curtis. "We have to prepare not just for West Brom, but for the Crystal Palace game [28 December] as well. The games come thick and fast. "If someone comes in they can take the reins if that's what they want to do, but we have to prepare. "It is important we bring a new manager in sooner rather than later, but it is more important to get the right manager and if that takes a while then so be it." Jenkins watched from the stands on Sunday, having returned from South America last week seemingly unable to strike a deal to appoint Marcelo Bielsa as Monk's successor. The chairman has a proud record of hiring successful managers, and has said there will be "no rush" to find the next one. Swansea dominated possession and territory in their goalless draw with West Ham, but were frustrated by their failure to convert their scoring opportunities. And although the stalemate means the Swans have won only one of their last 13 league games, the performance was an improvement on recent displays. "In terms of possession we were excellent. We looked like a Swansea City team again," added Curtis. "We bossed the game but we just lacked that killer edge up front. That is partly to do with the service they get. "Perhaps we overcomplicated at times, playing sideways and backwards rather than forwards. But it's something to work from, it is a good base." Swansea's players appealed in vain for a penalty in the second half when West Ham defender James Collins appeared to block a shot from Ki Sung-yueng with his arm. "I was not sure at the time, but when I see it on the screen it looks like a penalty," said Curtis. "When you're down the bottom perhaps you do not get the decisions you deserve. We just need that little bit of good fortune."